GOD seems desirous to show forth St Anthony to the world as the friend and protector of the poor by multiplying favours on behalf of those who invoke St Anthony with a promise of bread to the poor, should their petition be granted. Hence has arisen a new work called “St Anthony’s Bread”. Its origin and spread are really Providential. Let us hear her whom God chose to found it. “One morning” writes the devout lady of Toulon, “I could not open my shop; the lock was broken; I summoned a workman, who laboured uselessly for about an hour, and then losing patience, said to me: ‘I must go and get tools for forcing the lock; it is impossible to open it any other way.’ While he was absent, I said to myself: ‘If I promise some bread to St Anthony for his poor perhaps he will cause the lock to be opened without injuring it.’ Just then the workman returned with a friend and I said to them: ‘Please do me a favour, I have just promised some bread to St Anthony of Padua for his poor; instead of forcing the lock, be good enough to try once more to open it; perhaps the good Saint will come to our help’. They acquiesced, and the very first key they put into the lock opened it without the least trouble, as if it were the right key. I cannot depict the astonishment of all who stood by. It was universal. 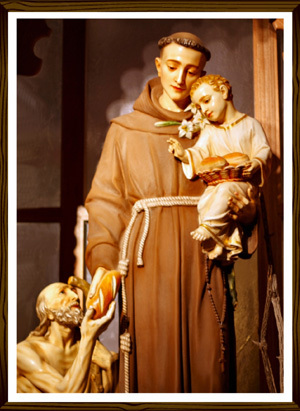 Since that day all my devout friends have supplicated the good St Anthony with me, and our smallest trouble has been submitted to him with a promise of bread for the poor. We are amazed at the favours we have received.” From the humble shop at Toulon, the work has in a few years spread all over the world, everywhere obtaining marvellous favours from St Anthony and bringing relief to the poor of the Lord. His Holiness Pope Leo XIII, in a Brief dated March 1, 1898, gives high praise to this work and exhorts the faithful to foster devotion to the Wonder-Worker.